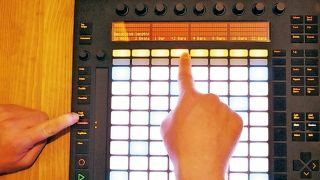 Ableton's Jesse Terry offers a handy tip for using Push's Fixed Length function when recording ideas into a new clip. "I generally keep this off, but there is a cool trick when making a long recording. "With Fixed Length off, press record, and start playing and working on a riff - I generally practise with Record on, and once I feel I've got it right, I press the Fixed Length button, which ends the recording and loops the last few measures of the long recording (depending on the Fixed Length setting). It's a good way to practise until you get it right, and then loop the part when you've finally nailed the perfect take." Step 1: With Fixed Length deactivated, the length of a recorded clip will extend until you deactivate recording. When Fixed Length is active, Live will record for a predetermined length and then loop. Hold the Fixed Length button to set a value of between 1 beat and 32 bars. Step 2: With Fixed Length deactivated, hit Record and begin jamming away. As expected, the length of this new clip will continue to extend as you play. As soon as you're happy with a section, punch the Fixed Length button to loop the final take. Step 3: Fixed Length is great for generating multiple clips and variations, too. Activate Fixed Length, set a length, then record in an idea. Press New, come up with a variety of loops, then switch to Session Mode to move between or launch the different ideas you've made.